Public lecture on “Ambiguous Belonging: Race, Citizenship and Filipinos in the US Empire,” by Dr. Katrina Quisumbing King. The lecture will discuss the conflicting classification of Filipinos as “foreigners” and yet considered “nationals” of the United States at the time the Philippines was a colony. She will then draw some implications on the treatment of Filipino World War II veterans. Dr. Quisumbing King is Provost’s Postdoctoral Scholar at the University of Southern California, and soon to be a sociology faculty of Northwestern University in Fall 2020. More details about the event are found in this Link. Deadline for Call for Papers in “Conference 2019: Emerging Voices in Filipino and Philippine Studies” has been extended to May 15, 2019. 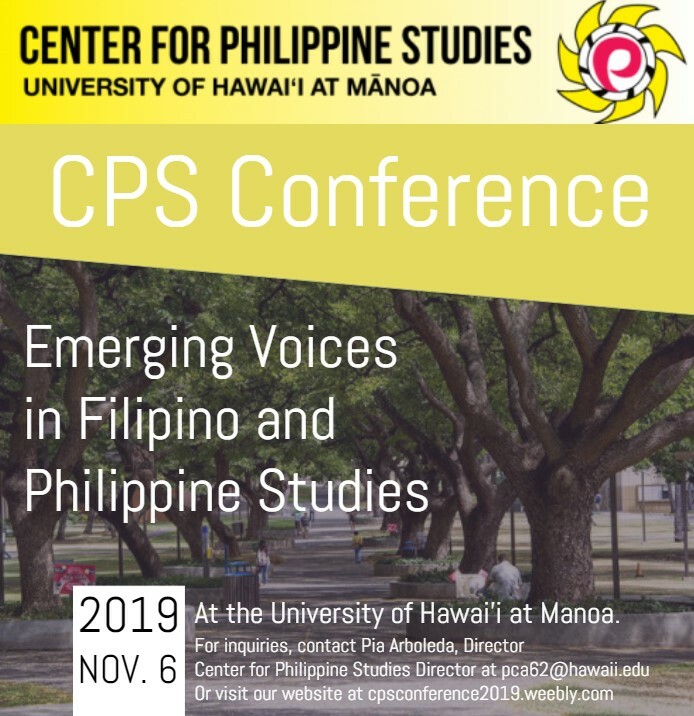 More details about the 2019 Philippine Studies Conference are found in this Site. CALL FOR PAPERS ON DR. JOSE RIZAL! Rizalistas and other scholars and enthusiasts of Philippine hero Dr. Jose Rizal are invited to attend this conference, August 23-25, 2019. Yes, right in Honolulu! 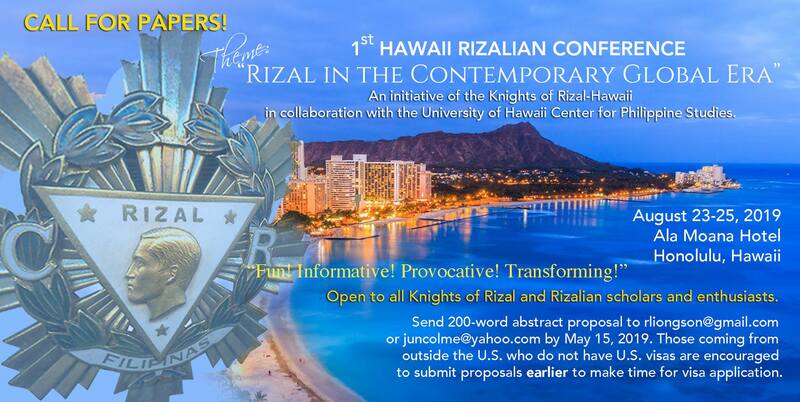 This conference is an initiative of the Knights of Rizal-Hawaii Chapter, and UH Center for Philippine Studies. Come and join us! Here, they will discuss the results of the recently conducted plebiscite, as required by the Bangsamoro Organic Law signed by President Duterte in July 2018. Majority of the voters in the affected area favored the setting up of the Bangsamoro Autonomous Region for Muslim Mindanao (BARMM), except for some areas that would not be included in the new government for the Muslims (Moros). The speakers will discuss what is in store for the future of BARMM. 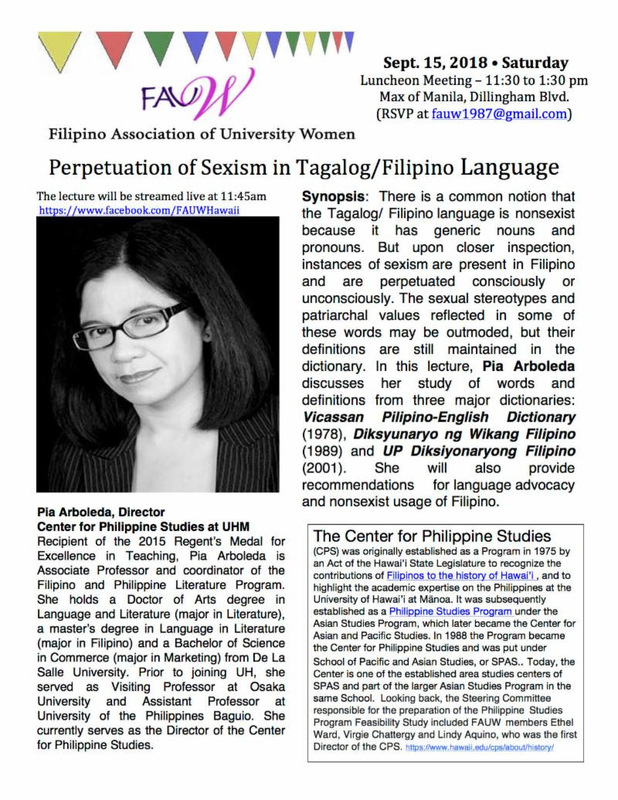 The event is jointly hosted by the East-West Center and UH Center for Philippine Studies. For details, please click on Flyer. To RSVP, please call 944-7111. Please come and join us for the lecture on the Bangsamoro Organic Law (BOL), December 13, 2018, Thursday, 12:00-1:00 pm at East-West Center, John Burns Hall, Room 3012. The speaker is Mr. Justin Richmond, Founder and Executive Director of Impl. Project. He will discuss the newly approved law called Bangsamoro Organic Law that will establish an autonomous Muslim government in Mindanao, Philippines.